There are some realities, whose darkness is so total, they violate the mind. There is no justification. No explanation. Only a sacred "No" that wells up inside. Last Friday, when driving back from Peoria to the small Illinois town of Monmouth where I have been living and teaching at the local college for the past 8 months, I passed a pig transport truck. This sight is not uncommon. Monmouth is home to a Smithfield-Farmland pig slaughterhouse. Transport trucks from Illinois and Iowa carrying creative, sensitive, receptive creatures pull in six days a week, through rain, snow, or heat. The plant is located openly on the highway tucked behind a retail strip mall with a Verizon store and Mailboxes Unlimited. Farmland does not have glass walls, but nor is it hidden, leaving me to wonder if Paul McCartney was right. Does knowing change things? The first time I parked in the grocery store lot on the adjacent side, I heard the resistant screams of pigs being offloaded into the bays. It took me a moment to differentiate between the high pitched squeal of a front-end loader maneuvering in the distance, and the separating cries of individuals being herded toward the gas chambers. The plant kills 55,000 pigs a week; just under 3 million a year. Nearby kill houses in Beardstown, IL and Columbus Junction, IA process similar numbers. Trucks start arriving in earnest at 6am, so any morning trip out of town results in passing the incoming convoys. That morning, taking my old dog-friend to the veterinarian in Peoria, I counted 9 trucks heading in, around 1800 pigs in total, holding my hand up in a feeble gesture of witness and saying aloud, "I see you" which has become my custom, likely for my own sake, more than that pink-grey apparitions swaying behind the metal slats. Much of my adult life has been spent in learning about and participating in farmed animal advocacy. I grew up in the mitten-shaped state of Michigan, where the annual 4-H fair taught me the few things I knew about farm animals as a teenager. Many of my classmates raised and sold farm animals in order to pay for college and there were numerous Amish communities nearby. So I was surrounded by that unspoken and unquestioned foundation accepting animal use so prevalent in rural, farming communities. After putting myself through undergraduate and graduate school in fits and starts, along with a career in muscle therapy, I decided to move my peripheral interest in animal ethics to the center of my life, and relocated to southern California to pursue a Ph.D. Not long after landing, I leafleted with a volunteer from Vegan Outreach at massive summer concerts such as Snoop Dogg, Green Day, and No Doubt and soon after took a job as the Outreach Coordinator in Southern California for the organization. For the next 18 months, I traveled to 90+ college campuses from Bakersfield to San Diego distributing information on factory farming, often buoyed by the thoughtful engagement of students coming to awareness about the realities of industrial agriculture. Meanwhile, in my writing, I was investigating worldviews that support this systematic subjugation and use of animals-because-they-are-animals. My question was simple and impossible: How did societies of individuals who obviously care for creatures a great deal permit the massive industrial machines of farmed animal breeding, torture, and death to continue? What ideas support it and what, if any, world visions reject it? When I came to Monmouth as a Visiting Assistant Professor, I knew the slaughterhouse would be my focus, and I quickly set about interviewing anyone who was involved in any part of the operation so I could understand more fully how this Midwest plant worked in real time. I talked with immigrants from Africa, the religious refugees from Burma, the Latino population who all staff the kill house, along with the Burmese minister, the head of Farmland's human resources, the regional Imam, the head of the cold storage facility, nearby field farmers, the director of downtown development, local community organizers for immigrant communities, the superintendent of the regional schools, among many others. I needed to do something that would prepare me for whatever would come next, I needed to meet my new community and see them in their singularity and stories as well. In all of this, I subtly implemented the adage, "yes, and," that is the hallmark of improvisational comedy. What else can I learn? Who else can I talk to? In this short time, what I can I do to better grasp the pressures and demands that keep the trucks pulling in? All of it requires a certain lively engagement and simultaneous numbness. A kind of desperate scramble-strategy always asking what is most effective now and tomorrow? Yes, and. Okay, yes. And. But today on my drive back, rolling with the tide of trucks to slaughter, I slowly overtook a transport, not filled with the 250-pounders bound for someone's bite of bacon in Arkansas, Nevada or China. The truck was filled with hundreds of piglets, a vivid pink cartoonish against the grey metal and greening grass of April beyond. Their noses hardly reached the first slat and every hole had a flying ear, a wriggling set of nostrils, four or five faces crammed together with bright eyes surveying this world that they are likely seeing for the first time, and likely, I knew with a moan escaping my own mouth, the last. 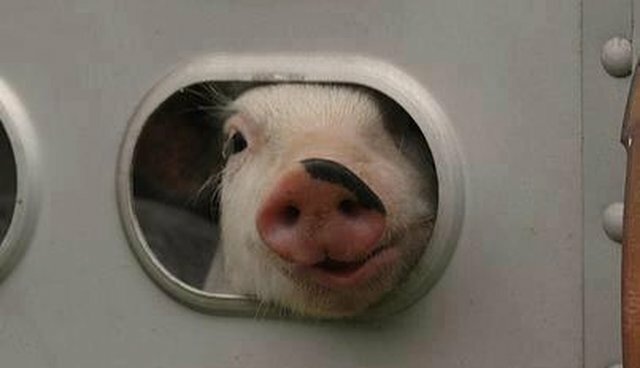 They could be so-called "feeder pigs," being delivered to an industrial "finishing" farm. Or they could be going to the gas for the grotesque delicacy of suckling pig, babies suckled on their mother's milk for 2-6 weeks before death. The bioethicist Leon Kass once said in an interview regarding his concerns over stem cell research that "The culture that seeks indefinite prolongations of its own life . . . is a culture that is increasingly hostile to renewal and to children." In the new flesh of these piglets, I felt the gut-scraping truth of a society that is indifferent to the promise and awe of new life, where profits and inessential gustatory pleasures justify the merciless creation, separation, desolation, and extermination of these newborns, full of vitality and hopeful expectation-to be met only with bleakness, violent hands, and terror. In his UC Berkeley impromptu address on the university's crack down on free speech and civil rights organizing, Mario Savio half-shouted his desperation, "There's a time when the operation of the machine becomes so odious, makes you so sick at heart, that you can't take part! You can't even passively take part! And you've got to put your bodies upon the gears and upon the wheels...upon the levers, upon all the apparatus, and you've got to make it stop!" The long-term strategies of animal advocacy and the entwined tasks of human-animal-planetary liberation require a many-sided movement of direct action, vegan education and outreach, public policy and legislation, grassroots protests, scholar-activists challenging institutions, and the renegade use of technology to expose the commonplace brutality of the food-animal system and contemporary industrial agriculture. These coalitions are not single minded and entail a lot of "yes, and." But at their base, they emerge from a sacred "No," that catches in the throat, that calls forth a heart sick cry of disbelief, fury, and unmoving resistance. Alternative futures will be called forth upon the crest of this refusal. And to the hundreds of co-creative planetary companions whose noses stretched to smell a future they will not have, I stake this No. Steadily, No. Bound with others, No. Toward a different tomorrow.